With many years of experience restoring and racing all types of Sprite & Midget, one of the most entertaining and iconic is the Sebring Sprite. 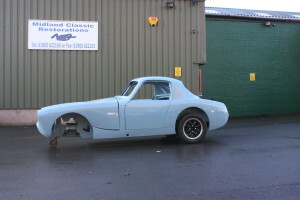 The semi-monocoque design of the sprite provides a strong and light platform which even with a mildly tuned engine provides a raw driving experience that will shame many a high powered modern car. We have designed 3 basic restoration packages to take an original shell fully rebuild it and prepare the car for track work. Our FIA package is designed for people who want an Appendix K car for historic racing so is built to a exact spec, the trackday and classic racers have more flexibility with some modern components. With the light weight of a Sprite you can be looking at a power to weight figure of around 260 bhp/ton. 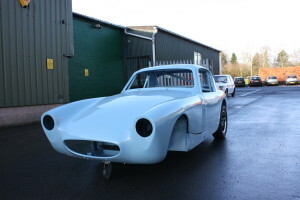 Here we will fully restore a shell and add new and fully refurbished running gear based around a 1330 fast road engine and suspension upgrades, a rear roll cage and period style seating with harnesess. This will prove to be an economical road legal trackday car. Using the multi championship winning experience of MCR managing Director Dominic Mooney, this package includes a full race 1380 engine and straight cut gear box, full cage, race seat and harness and everything you need to go straight out and win in championships such as MG Midget Challenge, and CSCC Swinging sixties. At around 580kg and 140 bhp that’s around 260bhp/ton. If your looking to compete in FIA historic races you’ll need a car with an FIA passport. We have the experience and the knowledge to build a fully legal and competitive car, and will supply it complete with the required FIA paperwork completed. With such a car you could enter races such as the Spa and Silverstone classic.